Prices are merely an estimation for comparison, they’re based on information found on the internet a few months ago. Some may have changed by a few hundreds of euros by the time you read this! I did’nt have the time (or rather did’nt make time) to write more about this in the last few weeks but in the mean time I ordered (and received) an FT-DX5000MP. The decision was a little less scientific than it started in my previous post however. Let’s say it has been partly emotional also. For me it was the 18th year in a row and I can say I have seen a steady decline of the rally over the years. Every year there are less vendors at the flea market and at the ‘new’ market. I guess there are a few reasons for this: the prices for the rental of the fairgrounds and the competition of the internet sales. Watch out Kenwood, Yaesu, Icom and all other manufacturers who try to sell us Euro 10000+ rigs! 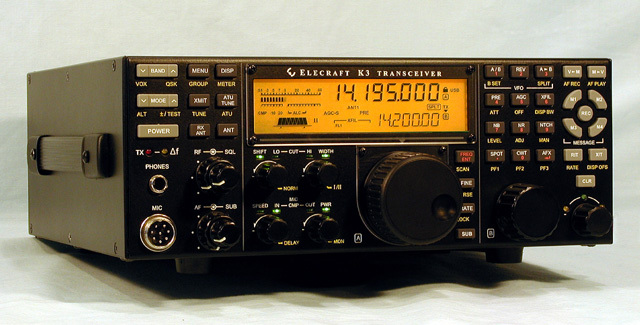 Elecraft has announced the K3! Not too much info yet but here is the data sheet. I haven’t got time to really analyse all the specs and possibilities but it certainly looks promising!. Way to go Elecraft!!! I have been looking into my K2-problem over and over and I can’t seem to find anything wrong. As I haven’t got the time nor the courage to take out and rewind the toroids I decided to order them ready made from the ToroidGuy. And, pleasant surprise, turnaround of this order is only 5 days!!! Ordered last sunday (25 feb.) the package arrived this morning! Thanks Mychael! Due to some health worries I haven’t looked at the K2 project the last few weeks. Upon ‘deeper’ analysis in the hospital it seemed the worries were far greater than the real trouble. I’m fine now thanks. So today I started looking at the K2 again and I started with the homework I received from Gary AB7MY at Elecraft to try and find the causes of the spurious signals that come out of my K2 on 10 and 12m. But, it seems my Digital Multimeter has trouble with the HF-signals. When my K2 is on transmit (on dummy load of course!) it seems to measure voltages even without the leads being attached to anything…. So I guess I’ll need a better DMM or a better dummy load? After discussing my K2 signal problems with Don W3FPR and Gary AB7MY, the problem seems to need further investigation. As soon as I can find time I’ll post more info here! Added some comments about the measurements on the K2 transmitter and the way we ‘cleaned up’ the signal. K2 sn 5549 is now definitely ready to get on the air! I’ll be able to do some measurements using (semi-)professional gear.